Yeh that’s why they’re cheaper, as with a lot of Poundstretcher food stock. I’m sure these will last longer than the best before date too. Bargain! They were on the shelf they are dated 18 - 04 - 2019 so maybe that's the reason, I know they won't last long in this house. Were they end of line or on offer or just priced pls? I have found these very hard to get hold of the only other supermarket I can find them at is Tesco and they are £4 there. What about the Microbubbles ! Two thirds coffee, one third milk, one third foam. Come on, Skybird! What's a Flat White ! My advice is to buy black coffee pods only instead and to invest in one of these: https://www.hotukdeals.com/deals/severin-sm9688-milk-frother-5485-amazon-germany-3204331 If that's too extravagant, then this one should do the job: https://www.hotukdeals.com/deals/hostess-induction-milk-frother-warmer-1998-delivered-white-knight-3201251 It's a massive upgrade in taste over the artificial long life milk you get in those pods! Chocolate strawberry or vanilla flavour 10 capsules for £1.99 can be served hot or cold. Not an original Dolce Gusto product but are compatible with the machine. Yep, totally vile. Just water with a bad taste. Took mine back and got a refund. Wish I'd read this thread first! Yip pure manky as we say in Haggis muncher land! Only milkshake my kids have ever left unfinished. Truly awful chemical taste. Caffé Gusto (Dolce Gusto compatible) pods short-dated in Poundstretcher. Good price particularly with the free shipping. On the weak side for me so I'll pass but voted hot. Good deal considering they are usually about £4 each Heat added. Showing as £46 not £28 ?? I was about to post to say that I'd recommend getting a model with auto-off and people will regret it if they don't. I don't know how I'd live without it. I'd never get it right manully, especially in a mug. If you disagree with the recommended level, can't you just put it on the level you believe is right? Or worst case, you can still put it on maximum setting and manually push the lever back when you get to the right level. See post above but: "Aldi compatible pods are called Alcafe Barista Moments. They have Latte Macchiato and Cappuccino versions. They are in boxes just like the Dolce Gusto pods. Lidl do compatible pods called Bella Caffé. They have Latte Macchiato and Cappuccino versions. They are in bag packaging. 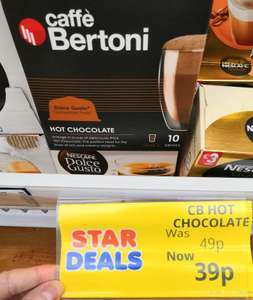 Also some compatible pods (I haven't tried) are available in Poundland for £2 called Café Berioni see deal HERE. I believe Farm Foods also sell these. You can get Malteser or Galaxy pods for around the £3 mark at Aldi or B&amp;M, see deal HERE These are nice and get approval from my DD." 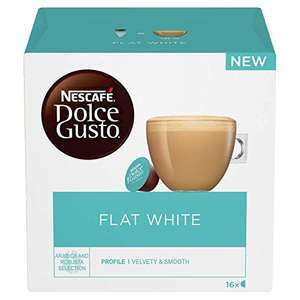 Nescafe Dolce Gusto Pods are £3.29 at Poundstretcher! Don't know why this is cold. They're £4 in most places. Great find. Heat added. Voted hot, wanted to post this deal yesterday but the Tesco one was better and still active. Not a fan, but this is slightly better than the usual 3 for £10 deal. Cold pods are a rip off and more importantlyan environmental disaster. get a bean to cup machine instead you will save money in the long run and they are more convenient. At tesco only 3 pounds! Find the froth a bit much on the flat white otherwise nice. Only ever seen the Flat White in Tesco. Not a massive fan. Certainly doesn't taste like any Flat White I've ever had. Found today in B n M pretty fair deal I thought, Box of 16 capsules cheaper than norm price plus a not so bad mug :) Had the Americano version too. Saw this in Bedworth store this afternoon so it should be national. Available in all stores or location specific? Good deal. This machine has an electronic drink size selector, as opposed to having the physical lever or even being completely manual. The included extras make this really good value. Thanks for this @ryanfpaskin I've just added a bit more info to your title and a pic to description to show you get a travel kit too. £3.50 at the moment. 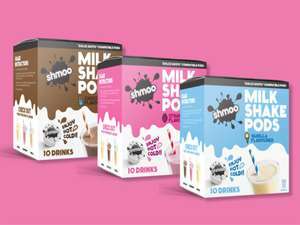 As people have already mentioned they're also currently £3 in Tesco and ASDA have a long term offer both instore and online where you can get 3 boxes for £10 (£3.33 each). Yes I noticed this today and it includes cafe au lait which isn’t often included when dolce gusto pods are on offer! Have we had the international mega draw yet in your make you laugh thread? Wondered if SAM won it!! My asda switch between these and tassimo. Asda have been 3 for £10 for the past 4 months!! I must admit that when you use the supplied milk pods, which are basically long life milk made with water, then yes any coffee is going to taste like arse. My advice is to invest in a separate milk frother made with fresh milk and just buy the black coffee pods (Americano). Made with fresh milk even Dulce Gusto pods (whatever the brand used) are a massive hassle free upgrade over instant coffee, made even better with a shot of Amaretto liquor. I much prefer the nescafe ones. It all comes down to personal taste and budget. Is it my machine or are the cup sizes that this fills really small??? For anyone who may have stumbled into Aldi half drunk and purchased these without realising that they don’t fit into a nespresso machine; you can cut them open and put them into a mug and mix with water.... it’s not fantastic (maybe the pods maybe the method) but it beats throwing them away. Are the used plastic pods recyclable? The stylishly designed NESCAFÉ® Dolce Gusto® Oblo pod coffee machine, with its original design, will be the highlight of your kitchen. I got this free with "very" home insurance. It's good. The Dolce Gusto pods are rubbish though. Cafepod ones much better. Auto shut off, good value, I know pods are expensive but you can get compatibles now. I think this must've been a mistake, the page now just says 'Oops, that didn't go to plan'. I managed to pick one up for this price last night. Or maybe they just sold out. Bought this the other day - Asda are doing a 3 for £10 on pods at the moment. 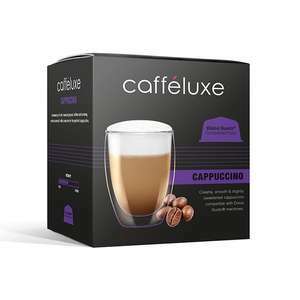 Got some of the Aldi compatible Cappuccino pods today, every so slightly weaker than the real thing, but considerably cheaper. Founded by Nestle, Dolce Gusto offers coffee machines that use coffee pods, each of which holds a perfect amount of coffee ground for any cup of coffee, and produce coffee with one click. Dolce Gusto machines come in a wide range of sizes and types, with advanced timing and drink preparation features. They let you create gourmet-style coffees in your own home. However, they aren’t always affordable so it is critical to always consider both pros and cons of the machines. This buyer’s guide will explain to you if it will be worth it to buy a Dolce Gusto coffee machine and if so which one, or if not, why it may not be the best option for you. Nescafé Dolce Gusto machines, and capsule coffee machines in general, are relatively new despite its prevalence. Although the technology behind them started developing in the 1970s, the first Dolce Gusto machine was introduced to the market in 2006, when the Melody series debuted. Since then, Dolce Gusto has become a kitchen staple around the world. As a slightly more affordable alternative to Nestle’s Nespresso machines, Dolce Gusto’s coffee pods are now found in almost every supermarket across the UK. During this short period of time of existence, Dolce Gusto machines have been constantly improved, adding refinements and new features, such as LCD displays, larger drip collectors and increased pressure. This shows that Nestlé constantly seeks to improve their products so they can be more efficient and user-friendly. The range of capsules on offer has also expanded rapidly and exponentially; now it includes a massive array of flavours and countries of origin (see below). If you are a coffee addict who is tired of having to wrestle with a standard coffee maker in the morning, Dolce Gusto machines could be exactly what you are looking for. How Do Dolce Gusto Machines Work? Nescafé Dolce Gusto machines use single-serving capsules that come in packs of 15. All you need to do is to stick one of them into the machine, add water and press a button to get a delicious coffee beverage of your choice. And this will only take around 20 seconds. The machine then generates 14 or 15 bars of pressure, perforates the capsules, allowing the pressurised steam to filter through the campuse before the coffee is made. This only takes about a minute or so, unlike an espresso machine at a standard coffee shop. Movenza — An extremely compact, futuristic-looking device, the Movenza is small enough to fit in a tiny kitchen, bedroom or a study. This is perfect for students or professionals that want to have gourmet coffee accessible anytime within arm's reach. Eclipse — Eclipse has a unique looped style that transforms into a twist as coffee is brewed. Not only does it has a striking design but it is also packed with feature with intuitive touch technology, an automatic closing head for easy coffee preparation, and the ability to accommodate different cup sizes. Drop — Slightly more expensive than standard models like the Melody, Drop has a more advanced user interface that lets you make more complex coffee drinks in a short time. Mini Me — As the name suggests, Mini Me is minimal in size, taking up barely any space. It comes in red, grey and matt black and is a good option for households with limited space. You can even take it when you travel for holidays. Colors — Colors is a compact, minimalist machine with 3 interchangeable coloured back panels included when you buy the machine. The tank can make up to 25 espressos but it can be awkward to refill. Lumio by Krups — Lumio is another compact machine, perfect for making long drinks. It can accommodate different cup sizes, but there are multiple steps for use and the water tank is awkward to fill. Genio II — Compact and powerful, the Genio II is perfect for smaller kitchens, yet still make great coffee every time. Infinissina — Infinissina has a striking design and is one of the most interesting coffee machine yet! Inspired by the infinity symbol, the slim coffee machine adds a touch of style to even the smallest kitchens. It is easy to use, but can be expensive to run. Jovia — Jovia has a striking bullet-shaped design, which makes it especially attractive and stylish. It’s also practical and easy to clean and use. Piccolo — As a budget option, Piccolo may not offer a massive range of features but it brews perfect standard coffee. Piccolo is a handy entry-level Dolce Gusto machine. Oblo — Another relatively affordable option, Oblo is small and unique in its shape. When it comes to coffee, it brews just as nicely as any other Dolce Gusto machine. What About the Pods? What Kind of Drinks Can I Make with a Dolce Gusto Machine? Café au Lait — Café au lait is a simple coffee with a hint of milk. Dolce Gusto uses a milk capsule and a coffee capsule to create a perfectly balanced delicious blend of coffee and milk combination. Decaffeinated varieties are also available. Cappuccino and Latte — These drinks are made of a shot or two of espresso and added milk. The milk capsules come in varieties like soy, standard and skinny milk. You can make also make an iced latte on a hot day or a macchiato if you want a shorter drink. The frother on Dolce Gusto machines create just the right consistency of milk froth, letting you achieve the rich taste of coffee shop beverages. Espresso — With a Dolce Gusto machine, you can make a espresso (or a double espresso) that tastes like it is professionally made. The machine creates a perfect crema finish to your espresso and you can also go for a ristretto or add a flavour like caramel and chocolate. Chocolate — One of the best things about a Dolce Gusto machine is that they don’t just make coffee. They are just as good at making hot chocolate and mocha that contains both coffee and chocolate. So if you have a sweet tooth and need a chocolate drink before bed or after lunch, you can easily make one within a couple of minutes with a Dolce Gusto. Tea — Some people are more of a tea person than a coffee person. With varieties like citrus honey black tea, chai, peach, lemon, and Marrakesh style, Dolce Gusto satisfies everyone. As you have read, pretty much everything on your local coffee shop’s menu is covered by Dolce Gusto. All of these drinks come in packs of 15 capsules and they always work out much cheaper than getting your daily dose of coffee at Starbucks or Costa. Weight — Some people, whether you are in the office or travel a lot, move their coffee machines around from room to room and the light weight can come as perks. 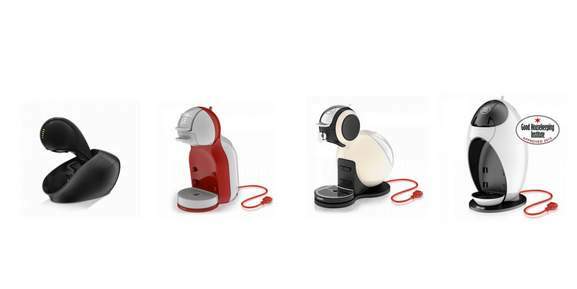 Lighter machines from the Dolce Gusto weighs as less as 2.5kg (Mini Me) and are easy to move them around. Others are 1-2kg heavier, which you also should not have too much trouble lifting. Capacity — All the machines in the Dolce Gusto range have a tank capacity measured in litre. For instance, Mini Me can hold up to only 0.8 litres of water, while Melody can hold up to 1.3 litres. If you expect to have occassions where you need to be able to quickly make a couple cups of coffee in a row without having to refill the tank, go for the one with bigger capacity. However, if you just need to make a daily morning coffee before you leave for work, smaller devices will work just fine. Warranty — All Dolce Gusto machines come with a 2-year warranty, so if you experience any technical issues during the first two years, you will be able to get a repair. However, make sure to check this when you are buysing a Dolce Gusto machine from another competitor, as warranty terms can differ from company to company. Extra Features — Sometimes, the little details matter. For example, some Dolce Gusto machines have steel drip trays, which last longer and are easy to clean, and others have LCD screens, which give users a great interface to easily brew a cup of coffee. So far, we’ve looked at the different Dolce Gusto machines and capsules, which might already be a huge appeal to most coffee lovers. Then, how much can you actually benefit from these machines day in, day out? On the plus side, Dolce Gusto machines are a quick, easy way to make espressos, cappuccinos, hot chocolate, and many others. From sticking a capsule in place to taking your first sip of coffee could be as little as 2 minutes, which is pretty impressive by home-brewing standards. They are also very compact. If you have a cramped kitchen and don’t want to fill up little space that's left with another gadget, a Dolce Gusto can be conveniently placed in an alcove and perform just as well as a bigger coffee machine. It can also be a great addition to other rooms; if you don’t want to clutter your study but need a constant caffeine boost while reading, a Dolce Gusto machine will fulfil your needs. Price is another area where capsule coffee makers like Dolce Gusto tend to be very reasonable. Due to their straight-forward mechanisms, the capsule machines are made simple, which is why they can easily be found for under £100 or even £50 with some HotUKDeals merchants. Another upside is that Dolce Gusto capsules come in many different types, which makes it easy to create delicious cappuccinos and other espresso drinks in a way that standard coffee makers can't. If you have an acquired taste in coffee and cannot be satisfied with standard drip coffee machines, a Dolce Gusto can give you the perfect froth on your coffee or a classic crema on your espresso every time. So there are plenty of reasons why getting a Dolce Gusto machine can be a reasonable choice. On the other side, the major downside is that whenever you use a Dolce Gusto machine, you need a capsule. And capsules aren’t the most affordable. When you make an espresso using standard brand fair-trade ground coffee, it will cost about 10p per shot. When you use a Dolce Gusto capsule to pull an espresso shot, it will cost 50p or more, which is a significant difference. However, this is still far more affordable than going to a coffee shop for an espresso. So you really need to consider if it's really worth buying. Another issue some people have with Dolce Gusto machines is waste. Every drink you make requires a plastic capsule, which cannot be reused. So the environmental cost of a capsule coffee is much higher than normal varieties. Additionally, you always have to use Dolce Gusto capsules that fit in the machine. Even though Dolce Gusto has a range of coffee varieties, if you want to try other blends or types of coffee, you may be out of luck. Moreover, if you are a person that needs a daily coffee but can easily get by with normal black or milky coffee, a standard machine will serve you just fine. How Do Dolce Gusto Machines Compare with Competitors? If you have made up your mind to buy a capsule coffee machine, the obvious next question is: which is the best brand to go for? Currently, there are three major choices on the market: you should consider among Dolce Gusto and Nespresso that are made by Nestle and Tassimo. There are also the small, less popular machines made by Illy and Lavazza. If you want to be able to make a variety of drinks, Dolce Gusto should be your first choice, followed by Tassimo, and then Nespresso. With Dolce Gusto, ristrettos, lemon teas, café lattes, chai lattes and hot chocolate are all available with capsules, providing maximum flexibility for drink lover's taste. Nespresso offers a wider choice of specific coffee roasts. If you have trained your palate to distinguish between the coffees from Guatemala, Vietnam and Ethiopia, Nespresso’s pods are easily the best option. However, Nespresso isn't the most convenient when it comes to making different coffee beverages. To make a cappuccino with a Nespresso machine, you will need a separate milk frother. However, the Dolce Gusto pods contain both milk and coffee that can be delivered together to make coffee with frothed milk with one click. On a brighter note, Nespresso pods are much cheaper than Dolce Gusto's. In general, Nespreso pods will cost around 35p per drink, compared to 50p for Dolce Gusto. Over time, this can add up to a significant difference even though it is still less than buying a daily Starbucks drink. Nespresso pods are available online or from Nespresso stores, while Dolce Gusto’s capsules are generally found in supermarkets like Asda, Tesco and Sainsbury’s. The decision is up to you. In general, if you are a coffee fanatic who enjoys gourmet espressos and americanos and likes coffee for its taste, Nespresso or Tassimo will be the right option for you. But if you want as many choices as possible, Dolce Gusto will be the right choice. Additionally, remember that there are more labour-intensive but affordable alternatives. Coffee machines from companies like De’ Longhi or Krupp can grind and prepare coffee and there are also stove top espresso makers, cafetieres and standard coffee makers too. Keep in mind that whichever option you choose, you’ll find the best coffee machine deals on HotUKDeals. If you’ve made up your mind to purchase a Dolce Gusto capsule coffee machine, what now? Well, the first thing you should do is to pick the right model for you. Something in the middle of the Dolce Gusto range like the Melody will be affordable, robust and convenient to use, but this choice depends on what priorities you have, for example, budget, functions, weight, and so on. When you know your model, check out the HotUKDeals Dolce Gusto listings, which is the best place to find the lowest best price for a coffee machine. You’ll find all of the Dolce Gusto range on sale from merchants like Argos, B&M Stores, Tesco, Amazon and Morrisons. Look carefully though, as Dolce Gusto machines are often randomly drastically discounted and the prices fluctuate a lot. The other thing to do is to buy Dolce Gusto pods in bulk. Again, start with the HotUKDeals listing. You’ll find Dolce Gusto pod offers from major supermarkets acorss the UK and it’s a good idea to bookmark the page if you regularly use your Dolve Gusto machine for your next time to restock. If you are considering buying one of the most expensive Dolce Gusto machines, waiting for the Black Friday season and January Sales could be a good idea. During these time periods, their prices drop drastically but for a short time period. So watch out for the Dolce Gusto deals as Black Friday approaches. Whether you love a rich, strong espresso in the morning, a perfectly milky cappuccino or a decadent mug of hot chocolate, Dolce Gusto coffee makers can create your favoriate drink within a minute or two. Convenient, affordable and reliable, Dolce Gusto machines have become a kitchen fixture in UK households. You can still buy one for your own kitchen for less with HotUKDeals.